PPT Public Limited, formerly known as the Petroleum Authority of Thailand, oversees the oil, gas and power sectors in Thailand. In recent years, the industry has been deregulated with consequential privatization and consolidation. This move has been necessary to attract more foreign investments. Thailand has 0.5 thousand million barrels of proven oil reserves as at 2009, while production was 330 thousand barrels per day, according to June 2010 BP Statistical Review of World Energy. However, consumption far outstrips production, and the country is the second net oil importer in South East Asia. Oil & Gas Journal has forecasted that Thailand’s oil and gas production will not be more than 250,000 bbl/d by 2011, although the country has purported 275,000 bbl/d last year. 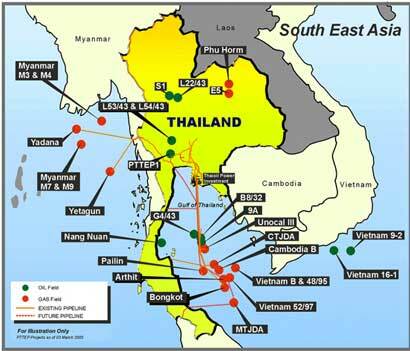 Most of the country’s gas fields are located offshore in the Gulf of Thailand. Though production of natural gas has been increasing over the past 5 years, domestic consumption has not been adequately catered for. A proven reserves of natural gas stood at 0.36 trillion cubic metres, and consumption was 39.2 billion cubic metres in 2009. Bongkot is the country’s largest natural gas producing field. Chevron is the largest foreign operator, involved in 22 offshore fields. Together they produce about 70% of the country’s natural gas production from 22 offshore fields. There are several projects aimed at increasing Thailand’s natural gas supplies over the next few years. The largest of these is PPTEP’s Arthit project, off the coast of Songkla. As early as 2008, PTTEP has announced that its Arthit Project has been producing natural gas at 370 million standard cubic feet per day (MMSCFD) and condensate at approximately 19,800 barrel per day (BPD). These figures exceeded the originally forecasted rates of 330 MMSCFD and 11,000 BPD respectively. In 2011, Statoil of Norway signed a Memorandum of Understanding with PPT Public Limited to co-operate on LNG, conventional and non-conventional resources in Thailand.